The research team led by Professor Insung Choi of the Department of Chemistry developed a sprayable nanocoating technique using plant-derived polyphenol that can be applied to any surface. This new nanocoating process can be completed in seconds to form nanometer-thick films, allowing for the coating of commodity goods, such as shoe insoles and fruits, in a controlled fashion. 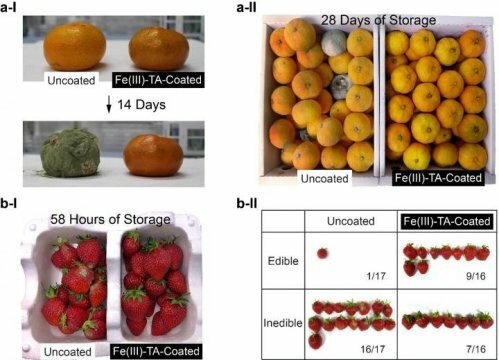 For example, spray-coated mandarin oranges and strawberries show significantly-prolonged postharvest shelf life, suggesting the practical potential in edible coatings of perishable produce. The technology has been patented and is currently being commercialized for widespread use as a means of preserving produce. The research results have recently been published in Scientific Reports on Aug 1. The research team combined these chemical properties of polyphenol-iron complexes with spray techniques to develop their nanocoating technology. Compared to conventional immersion coating methods, which dip substrates in specialized coating solutions, this spray technique can coat the select areas more quickly. The spray also prevents cross contamination, which is a big concern for immersion methods. The research team has showcased the spray's ability to coat a variety of different materials, including metals, plastics, glass, as well as textile fabrics. The polyphenol complex has been used to form antifogging films on corrective lenses, as well as antifungal treatments for shoe soles, demonstrating the versatility of their technique.